Though I’m not a member of Mountain Justice, earlier this week I wrote an op-ed urging students to vote for partial divestment. Since then, we have done just that. Over four in five students voted to divest with a turnout of 54.3%, roughly similar to the most recent American elections. President Smith and Chairman of the Board of Manager Tom Spock quickly sent out an email confirming that the college’s policy would not change. Though I admire much of their past work, I felt their response left more questions than answers. To truly answer why the Board rejects a clear message from the student body, President Smith and Chairman Spock should be able to respond to these three questions. Would you have refused to divest from apartheid? This most recent email did not try to argue against the merits of fossil fuel divestment. The Sustainability and Investment Policy that it directed us to only gave a cursory discussion. Instead, the Board’s response has consistently hinged on its 1991 policy to only use the endowment for the best possible financial results. In the Sustainability and Investment Policy, the Board notes that this decision was made in part due to a fear of excessive divestment demands. Yet this logic suggests that the benefit of divesting in legitimate cases is outweighed by the harm of future divestment movements, a logic that suggests divesting from apartheid was a mistake. Though of course the intricacies of the fossil fuel divestment movement and the apartheid divestment movement differ, and there can be legitimate debate as to their relative merits, the principle at the base of the Board’s policy opposes divestment in both cases. If the Board fully believes in their policy, they must be able to directly say that, were they in that position today, the Board would not divest from apartheid. What is the college doing to contribute to systemic change in the fight against climate change? In their response, President Smith and Chairman Spock pointed to three sustainability measures the College has implemented: reducing carbon consumption, sustainability education, and carbon pricing. These are undoubtedly positive steps and they should be maintained whether or not the college eventually divests. However, all three of these measures contribute to reducing Swarthmore’s carbon footprint without doing much to fight climate change beyond Swarthmore. Divestment, while limited, does contribute to the broader political movement to combat climate change. Ultimately these political efforts have the power to avert climate disaster, while reducing Swarthmore’s carbon footprint will only make climate change a tiny, tiny bit less destructive. I think Swarthmore should act as a leader and contribute to creating systemic change. The Board should be able to answer why they disagree. What voice do students have in college governance? For me, the most disappointing part of President Smith and Chairman Spock’s email was that it was simply a reiteration of past decisions. It seems clear that the Board would have made the same decision regardless of the results of the referendum, sending the message that students’ voices counted for nothing. While there is significant evidence that partial divestment would not have a large effect on the college’s finances, and in the long-term investments in fossil fuels will become less profitable, the Board is better qualified to answer that question than I am. It should not be decided by student referendum which stocks will be most profitable. Investment managers and the Board will do a much better job at that. But they shouldn’t be the only ones deciding what the endowment is for. Given reasonable estimates of the financial effects of divestment in debates between opponents and supporters of divestment, students voted to do so. What this vote showed is that students overwhelmingly believe that there are cases where the endowment should be used for social objectives. Fossil fuel divestment should be debated on its merits, but to simply decide based on the Board’s endowment policy raises serious questions about the distribution of decision-making power at the college. Faculty have expressed clear support for a past, though admittedly different, partial divestment proposal. 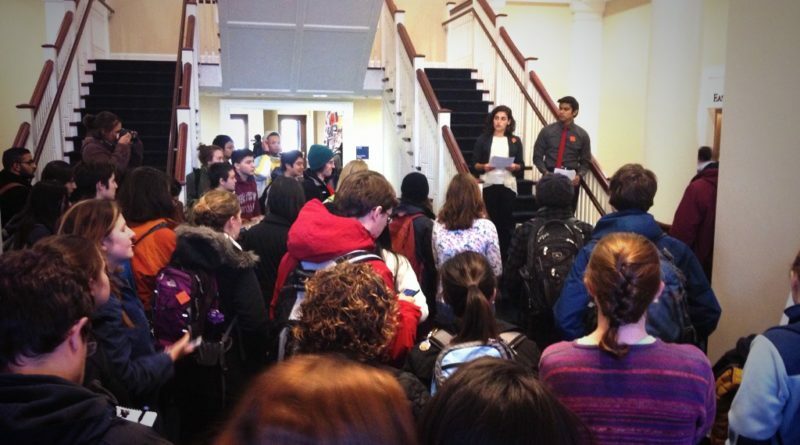 Students voted decisively in favor of partial divestment this week. The Board can argue that the endowment should focus on profit in order to sustain college expenditures like financial aid. But many students, myself included, voted that the endowment should not only be used for profit despite depending on financial aid for their educations. Doesn’t that count for something? The Board’s response suggests not, and that only they–a body made up primarily of very wealthy alumni–get to decide the purpose of the endowment. It’s hard to argue that fits with the values the college stands for. At their meeting this weekend, maybe the Board can come up with an answer to that. Featured image courtesy of Swarthmore Mountain Justice. One thing that students sometimes seem to overlook that is a most powerful avenue toward affecting climate change beyond the campus and that is the education in and out of the classroom that is imparted to them. The effect of making agents of change of students while they are living their lives on campus and taking that agency into the world with them when they leave should not be overlooked. Changing one’s carbon producing behavior while here is important and seeking to continue to make change in living and through ones career and choices of activist causes is a vital product of the experiences gained here. Please value that. Let’s be honest hear. Number 1, yes they are saying they would not divest from apartheid or anything. This is good because it prevents a number of divestments which could hurt the endowment as you mentioned, and it also prevents a knee jerk reaction to extremely immoral divestment such as the BDS movement should a vocal minority push for it like MJ just did for this. Number 2, I know very little about what systemic change from a college would look like and I would’ve expected you to ask why we aren’t doing specific things instead of putting the burden on the administration to think of something. Number 3, the endowment is unequivocally not our money and it’s absurd to suggest we should have any control over it. First of all, as you slightly eluded to but I’ll take one step further, it is absolutely ridiculous to suggest that divestment would earn the college money. It is incredibly stupid to suggest that a cursory glance at swarthmore’s stocks and reading a guardian article means that students know better than the professional investment managers we employ to manage the endowment. It’s really quite simple. If it becomes profitable to divest, they will. If they haven’t done it yet, it’s because all available information does not indicate it is profitable yet. It’s also not the student’s decision to make because that money is donated by alumni who want to see the college continue to operate at a very high level and give financial aid at the rate that it does. It is not our decision to make whether to forfeit some of their money in order to serve a social cause. 1. Allowing the endowment to be used for social objectives in certain cases doesn’t mean the college needs to agree to every demand for divestment. The current policy closes off both legitimate and illegitimate cases of divestment. And though you may fear that this policy encourages demands for divestment, it’s not as if the college isn’t getting demands for divestment anyways. Also, you suggest that the calls for divestment are coming from a “vocal minority.” 80.5% doesn’t sound like a minority to me. 2. In response to my point about systemic change, you write that “I would’ve expected you to ask why we aren’t doing specific things instead of putting the burden on the administration to think of something.” Actually, I did give them a specific thing: divestment! Other things to work towards systemic change that come to mind include: host academic conferences on climate change, host organizing conferences, support renewable energy research, expand environmental studies, intentionally invest in renewable energy companies. More broadly though, I think the Board is making a mistake when they only frame the college’s engagement with climate change as an effort to achieve on-campus sustainability rather than to contribute to broader change. 3. I explicitly said that the Board and their investment managers are better at determining what investments will be profitable than students, but I don’t think they should be the only ones deciding that the sole objective of the endowment is profit. The endowment ultimately exists to serve the Swarthmore community, the largest part of which is the students. I don’t think it’s absurd to say that students (and faculty and staff) should get some input in that. You also argue that “It’s also not the student’s decision to make because that money is donated by alumni who want to see the college continue to operate at a very high level and give financial aid at the rate that it does.” Don’t you think students depending on financial aid care about that too? But a student body made up by roughly 50% of students on financial aid overwhelmingly voted that the endowment shouldn’t only be used for profit. Again, I don’t think it’s absurd to suggest that deserves to have some effect on college governance. Not that I disagree with you, but for the sake of keeping the argument as strong as possible, I want to point out that 80% of a 54% turnout is not a majority. Not that I disagree with you, but I have to point out that 80% of a 54% turnout is not a majority. As you write, technically that is a minority of the student body, so that’s my mistake for writing that. Still, in terms of how we often think about elections, I think we often speak of majorities when technically that’s not the case. To give a parallel, it appears the highest percentage of registered voters a president has ever received was William Henry Harrison with 42.4%. Nevertheless, when there are landslides like Reagan ’84 or even Obama ’08 we wouldn’t say the president is merely speaking on behalf of a minority. By comparison, Mountain Justice got 43.9% of the student body. I wish more people had voted in the divestment referendum, and I think SGO could look at the referendum process and make some improvements, but there’s hardly any evidence that if everyone had voted the result would have been anywhere near a victory for opponents of divestment. I completely agree with you! Many swatties just don’t want to admit how the world works. They think they are doing things, doing these morally correct and big things which can get them the attention they want. But you never change the world by shouting out loud, you change the world by using informed ideas to convince people. That only about half the student body votes already says something, and MJ is only saying those 80% of those who voted. Come on, that’s not even a half. It’s really that simple: whoever owns the endowment has the right to decide what to do with it. The fact that the College is actively managing the fund for investment return benefits us students. Yeah you have the right to say we should divest from fossil fuel, but they have the right not to listen. The percentage of people who voted in the MJ referendum is the same as the percentage of eligible Americans who voted in the US presidential election… are you saying the electoral college results are illegitimate because of the participation rate? Furthermore, yes, of course attention is the goal. But I disagree that garnering attention is a bad thing. The whole goal of fossil fuel divestment is to stigmatize fossil fuel companies; or, in your words, bring attention to their negative impacts on climate and discourage other institutions from supporting them. I think I particularly disagree with the assertion embedded inside the second question, and it is the most important root of my own frustration with the fossil fuel divestment movement. Suppose we start from the premise that 1) every possible political actor–individual, group, institution, party, community–should do as much as they plausibly can with the resources and capabilities they have available to both contribute to minimizing their contribution to anthropogenic climate change and 2) should do what they can to change the American public consensus on acting to minimize climate change. When most of us do an inventory of possible actions in the first category, we may already be doing some of what we could or should do. We might identify things that we can do in addition. Some of those we won’t do. For example, many of us travel for reasons that are not strictly or absolutely necessary, for example–because we want to, because we are pursuing education or research elsewhere that arguably we don’t need to do, etc. I’m not quarrelling with this reasoning, just noting it. But we do what we can, and the more resources we have at larger scales, the more important that action is in terms of actually mitigating or reducing our contributions to climate change. But we all know that at some point, the sum of all that effort will not be systematically adequate to slowing or reversing anthropogenic climate change, not in and of itself. It only will be if fossil fuel extraction and refining slows and eventually stops and renewable energy infrastructure is dramatically built up, along with many other shifts and changes in how we live and work. Many people reason that this cannot happen unless there is a strong demand for systemic change from majority voting populations in most liberal democracies and some other form of pressure on more authoritarian states. The United States seems like an especially important linchpin in this shift. So how do you persuade people to change what they think about climate change and then to press for change through political organizing? That’s the heart of the matter in the debate about divestment, because divestment is, by the admission of its advocates, a strategy for persuasion, not a strategy for direct mitigation or reduction of contributions to anthropogenic climate change. I have been arguing for some time that the chief proponents of fossil fuel divestment misunderstand a good deal about the capacity of universities, non-profits and majority-liberal communities to influence or shift some meaningful fraction of opinion or consensus in the wider public sphere through divesting. Advocates misunderstand the kinds of cultural capital those institutions hold and the channels that they can expend that capital within, they misunderstand the way that divestment and asset holding signifies in the wider culture, they misunderstand the underlying social divides at play around universities and other knowledge-based institutions and how those divides are one of the major linchpins of popular American indifference or ambivalence about acting more forcefully on anthropogenic climate change. They basically don’t understand the diverse, complicated sociocultural architecture of American sentiment and opinion on this entire subject. We have just had a very painful confirmation of the degree to which many of us underestimate or misunderstand the currents circulating through American social and cultural life. I do not think that means that college and universities should stop trying to influence the national consensus on climate change, but I do think the emphasis on divestment among activists has always been a mismatch of intense effort to minimal (at best) reward, a preference for a tactic which is at best a kind of persuasive Rube Goldberg machine that rests on every part of that machine working just as activists believe it will work. 2017 is confirmation that almost nothing works the way they have believed it would, so it’s time to scrap the design. Let me suggest that it might well be that the serious pursuit of something like carbon neutrality, or trying to take the entire energy needs of an institution like Swarthmore fully off of the existing grid at some point in the medium-term future, and many other related measures, might be not just a way to test out strategies that other institutions can adopt and to train future citizens to keep pursuing technical, social and cultural forms of mitigation and adaptation. It might also be the most persuasive way to communicate our commitment to fighting climate change and thus to move the national consensus. Very few institutions are pushing around a billion dollars in investment funds or seeing investment strategies as a crucial communicative instrument for influencing popular opinion. If Mountain Justice is right that there will few or no financial consequences to Swarthmore from divestment, it is not even a demonstration of willingness to sacrifice. It’s just a rich institution demonstrating that it’s rich in an immaterial, ghostly manner that’s very far from the experience of people who do not have sizeable investment assets. But if we were to live differently, to work differently, to ultimately become the future we want, then that’s an exceptionally powerful form of persuasion–especially if we find ways for our new methods and choices to be something we can disseminate, we can teach, we can share. All the more so if that’s difficult–if it takes sacrifices or transformations that are more meaningful and pervasive than hassling a handful of administrators and trustees. Moreover, I can’t think of a more powerful way to threaten a destructive industry than to give it a steadily declining share of business and to show others how to do the same. That’s the most persuasive action imaginable in a market society. If universities and towns and office buildings, etc., are all in the market for new renewable technologies, for green buildings, for zero-waste infrastructures, and so on, that’s money talking in a way that no investment strategy can match. That’s a strategy of persuasion that connects to other institutions and communities, regardless of their assets and regardless of their ideological predisposition. Curtailing energy usage, going off-grid, building green, might in many cases eventually amount to cost-control strategies that might appeal even to people skeptical about climate change. Whereas announcing, “Swarthmore College, wealthy and quite liberal educational institution, shuns fossil fuel stocks, so join us, America, and tell your elected representatives to reduce subsidies to the fossil fuel industry” was already a naively imagined approach in 2012. It’s frankly a surreal distraction from the urgent emergency of national and global politics in 2017, one that mostly succeeds in communicating our self-complimenting insularity. The movement-building function: Divestment has successfully created a movement of activists around the country, and there are very close links between different campus activists and organizations engaged in this issue. It seems to be a campaign that’s relatively good at engaging activists, and I’d guess the localized goal of a college endowment helps with that. Outside of the actual impact of divestment, the creation of this movement is valuable. It drives discussions about climate change and this atmosphere reminds others on campuses of how serious a problem climate change is. A lot of these people would have said climate change is a serious issue if you asked them, but had you asked them what the most serious political problems were they might not have said climate change. The organizational infrastructure created by the divestment movement also engages in a wider range of environmental issues, enabling a stronger response to issues like DAPL and the Paris Agreement. Divestment activists were very engaged in the People’s Climate March. And divestment also has an impact on individuals that are now passionate about fighting climate change. A lot of them go home on break to the Bay Area or DC, but a good chunk also go home to places like central PA or Texas or Iowa. Still, the divestment movement will lose momentum if there are no victories. Swarthmore could provide one. Norm diffusion: You write that the message of divestment is that “Swarthmore College, wealthy and quite liberal educational institution, shuns fossil fuel stocks, so join us, America, and tell your elected representatives to reduce subsidies to the fossil fuel industry.” And that probably is the fully-processed version of the message divestment offers, and needless to say it doesn’t sound that good. But I don’t think that’s how everyone thinks. I would guess it’s more likely that someone is scrolling through their Facebook feed, briefly looks at a post, and without thinking about it, the message is reinforced that fossil fuel companies are bad and climate change is a problem. This is also how belief in climate change spreads. Not many people actually know how climate change works, but most people around them believe it and they hear about it a lot, so they too believe it. It’s true that some people will hear that the message of divestment is coming from a university and as a result of their distaste for universities will believe the opposite. I would guess that’s a minority though. And we should also remember that divestment isn’t only coming from universities, but also foundations and, I think crucially, religious institutions. If Swarthmore divested, probably some Quaker organizations would think we should too. If the Quaker organizations do, maybe some relatively mainstream Protestant organizations would see that and divest as well. And I think at this point you’re definitely reaching people outside the ivory tower. The role of universities: This point may be ill-advised, since I’m about to counter a history professor with some history I don’t have a great foundation in, and I fully expect to be told how I’m understanding this history wrong. Still, I think despite negative popular perceptions of universities, they still can play an important role in changing societal perceptions. An example that comes to mind is transgender and gender-neutral bathrooms. Universities were one of the first to move towards this practice. A decade or two ago the vast majority of people would have looked at this and thought it was liberal college students doing something weird. But now transgender bathrooms are a serious political issue, where even organizations like the NBA think it’s so wrong to take action against transgender bathrroms that the NBA will take very public action. I don’t think universities were the main driver of this trend, but the issue didn’t become toxic because they touched it. To the contrary, it continued growing rapidly. And I think there’s a long trend of universities pushing ideas that gained popularity despite the relative unpopularity of universities. I don’t think student activists have ever been that popular in a national context, and Vietnam War protesters and anti-apartheid activists looked out of touch and dangerous to many. Nonetheless, their argument ultimately won. I am a not-so-wealthy alum. I agree with all of your points and questions, and am extremely disappointed with my college’s response to this issue. Swarthmore prides itself on it “Quaker roots” but apparently the roots were not deep. One of the key values of my Quaker faith is that of stewardship. I happen to believe that stewardship of our earth is more urgent the marginal benefit of hanging onto investments in companies whose business is to destroy the environment to wring fossil fuels from the earth. I have been a regular contributor to the college, and I presently serve on the Alumni Council. It breaks me heart to know that Swarthmore is more interested in finances than in preserving the environment. Perhaps I should direct my annual contribution to Earth Justice instead. Thanks for your article. I am not in Mountain Justice either, but I voted for the referendum and sent the President an email expressing my disappointment immediately after she made it clear that the referendum would not be followed. I plan on attending the sit-in tomorrow and I urge others to do the same. Timmy, thank you for writing this article. Excellent questions for Smith and Spock. Matthew Stein, I am surprised that you would say that Timmy’s idea is “incredibly stupid.” He has already rebutted your argument so I don’t see any reason for me to do it again, but I think everyone’s work deserves courtesy and not insult. This applies at Swat and everywhere else in the world. black, who owns the endowment? You claim it is “simple,” but I think that if you look into it, you will find that no one, especially not the board of managers, “owns” the endowment. The board are the caretakers of an endowment that belongs to the entire Swarthmore community in perpetuity.